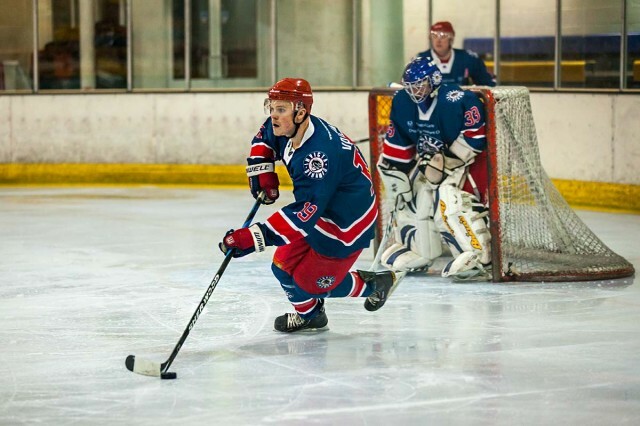 I really do love shooting sport but it’s not something I get the chance to do very often, so when I got an invite from Kevin Slyfield to shoot an ice hockey match I jumped at the chance. 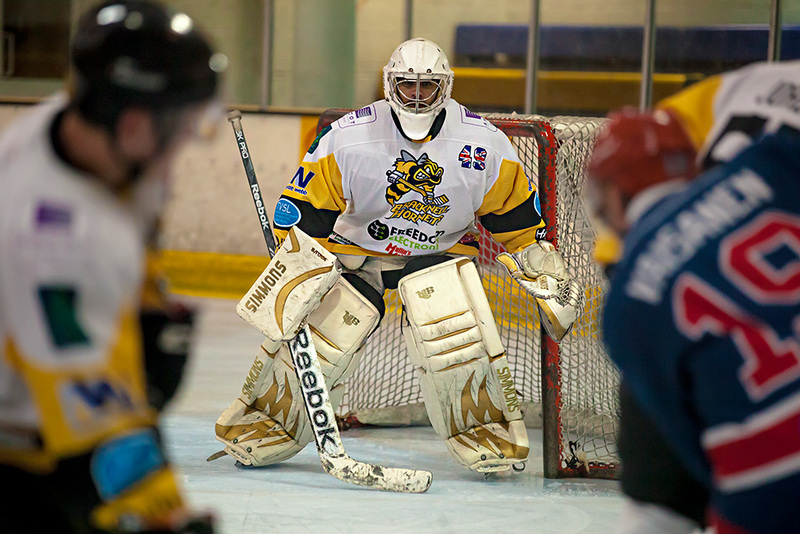 Kevin is the official team photographer for the Bracknell Hornets and is an excellent sports shooter as you can see from his Flicker page. Ice hockey is a sport I’ve never watched, let alone shot but in the past I’ve seen some amazing photos taken by my North American friends. I’ve also heard them say it’s one of the hardest sports to shoot due to its fast pace, low light and the need to shoot through Perspex. I did a fair bit of research before the game which included getting a very basic idea of the rules of hockey. I concluded the rules were bendable but generally included a brawl at some point. More usefully I opted to shoot with my Canon 70-200 f/2.8 IS lens which proved to the perfect choice for the night. When it came to camera bodies I had a choice of Canon 60D or Canon 5D Mark 2. The 60D offered faster burst shooting and longer reach with my zoom but the 5D2 has the best performance at high ISO’s. In the end I took both but used the 5D2. In some parts of the world such as North America, ice hockey (or just hockey as it is often called) is a national past time. Huge purpose built rinks which seat 1000’s of spectators are packed to the roof with screaming fans. Sadly ice hockey in the UK doesn’t enjoy even a fraction of that support. Even though I was shooting a minor league match I did expect a bigger crowd, which probably numbered less then 100 people. Fortunately both teams took things very seriously and it was clearly a competitive match. When it came to shooting at the rink I had two options. Shoot through the grubby, scuffed up Perspex or go up to the balcony level and shoot over it. For the first period I took Kevin’s advice and shot from the balcony. From there I was pretty much guaranteed good photos but for me they lacked a certain drama that I wanted to capture. For the second and third periods I opted to shoot rink side through the Plexiglas but finding a clear spot was impossible and although I could clean my side of the glass the rink side was covered in scuffs and marks. Eventually I found a bit that was marginally less damaged then the rest and shot from there. Even so shooting at an angle through the Plexiglas was pointless so I waited for the action to come my way. If, like Kevin, I needed to record the match I’d recommended shooting over the barrier but when the action came my way you can’t beat being at rink side. For settings I shot in manual mode as the lighting was constant and even, although there wasn’t much of it. After a bit of trial and error I settled on 1/640th sec, f/2.8 at ISO 4000. The Canon 5D mark 2 isn’t well known as a speedy focusing camera but sticking to the centre only focusing and continuous focusing with AI Servo it seemed to do surprisingly well all things considered. 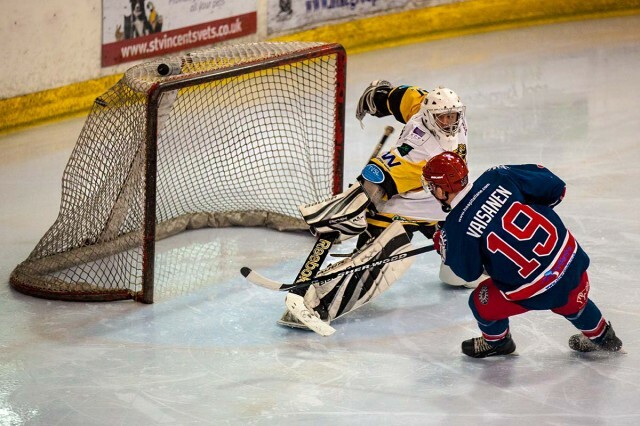 By the end of the game I’d really got into the swing of ice hockey and I can see why people love watching the sport and why everyone told me it’s one of the hardest to photograph well. 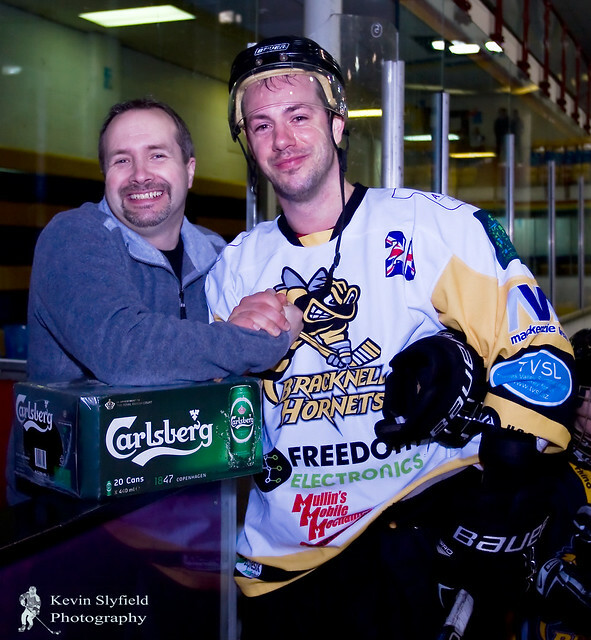 Kevin had one last surprise for me… I got to hand out the runners up prize (a box of beers) to the losing team. Excellent, Gavin. You look as though you had a whale of a time. Great photos, Gavin. I’m saving up for the 5D2 – can’t wait until I can afford one! Gavin, here in the USA they have holes in the corners of the rink glass for the sports photographers to shoot through. Well at least the NY Islanders do. Nice photos Gavin. You’re almost a Canadian now eh ! Welcome aboard. good job , yes in N America its little bit bigger , but hey its not about hockey its about photos , Thank you Gavin i am big fan of yours ! Nice shots Gav. Must be a real challenge shooting any high speed sports, especially with low lighting and awkward shooting positions. I take it you quite a bit of cleaning in post to get the great results. 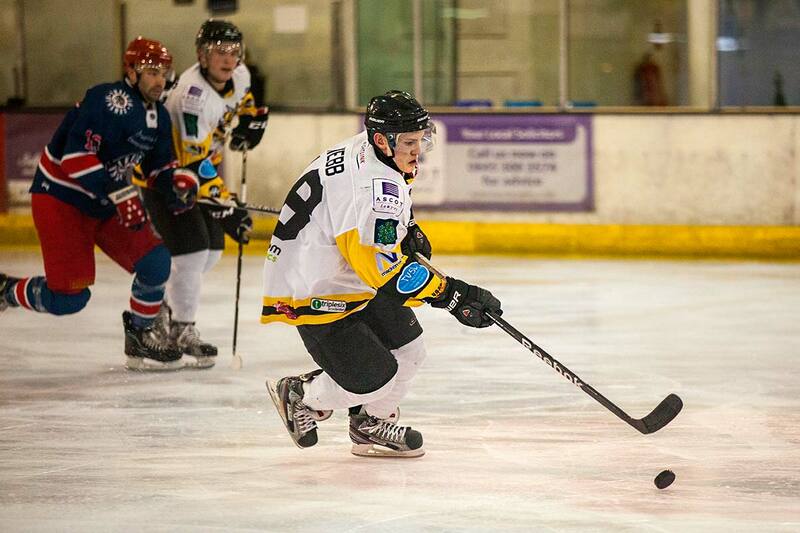 Ice Hockey isn’t a easy Sport for Photography!! The Problems i had is the Whitebalance. I had a clouple of Pictures wich had a strange one (half Part was correct und the second Part was completely wrong)!! And this depends on the Camera, some have this Problem a bit more, tha others!! But for your first time your Pictures are pretty good! Nicely done. I’ve found indoor sports to be tricky. I haven’t shot hockey but I was tasked with shooting a national volleyball tournament, getting action shots for sale to the participants. I used the same lens and camera body as yours. With nearly 90 courts across the floor of a huge convention center, lighting levels and color changed almost court to court. I started in AV mode at 2.8 on my 70-200, but I found that even at ISO 6400 my shutter speed dropped too low at times for 200mm zoom. And even the 5DII was too grainy at 6400. White balance was also an issue. The court surfaces varied red, black, blue, and a faux blond wood grain. Each had a different effect on light levels and reflected a strong color cast. I tried to compensate by using the Kelvin WB setting changing to a different temp depending on the color of the surface. It was hard work, but big fun, and I look forward to doing more sports. Yhanks again for your ongoing inspiration and tutelage. Bonjour Gavin, merci pour ce cours de photographie, j’ai beaucoup aimé l’idée du lancé d’eau avec le verre, c’est de l’Art cela est certain, pour la farine dans le décor c’est joliment pensé. J’ai participé à un mariage où les invités avaient fait des bulles de savons mes photos furent bien belles. A bientôt merci pour vos savoureux conseils qui donne un bel appétit d’artiste.